Prairie dogs are small animals which inhabit the flat lands of central and western North America. There are several species on the continent; the most popular being the black-tailed and white-tailed. Other species in the same region include the Gunnisons and the threatened species, the Utah and Mexican. Prairie dogs typically live in colonies known as “towns” and these towns can extend for several thousand miles! Needless to say, populations can and do reach numbers which put a strain on local vegetation. Because of this and other problems associated with large populations of prairie dogs, one must be careful when they start to colonize your property. It is suggested that you keep their numbers in check otherwise you can quickly be confronted with a population that becomes quite large. Prairie dogs are small animals, generally in the2-3 lb range, which have short strong legs designed for digging. Black tailed dogs can grow up over 4 lbs but are generally in the 2-3 lb size. White tailed dogs can grow almost as large but are most commonly around 1-3 lbs. Prairie dogs can create towns which can cover thousands of miles and include several million animals. Large colonies like these are not common anymore due to the use of toxicants which were introduced in the mid 1900’s. During those times the programs implemented had a dramatic impact. As much as 98% of the population in treated areas were killed off and in some areas none were left. As concerns rose about the impact complete elimination might have, restrictions were put in place. The Mexican and the Utah species were then labeled as a threatened species. This labeling protected them from being hunted, shot, trapped and poisoned. Natural predators like badgers, weasels and black footed ferrets were forced to find other food supplies; most adopted well but others like the ferrets had a hard time adjusting. Black footed ferrets soon became endangered as well due to lack of food. However, all species began a strong comeback in the 70’s which has continued through the millineum. At this time prairie dogs are ever increasing and with this population increase they are coming in conflict with man more and more. 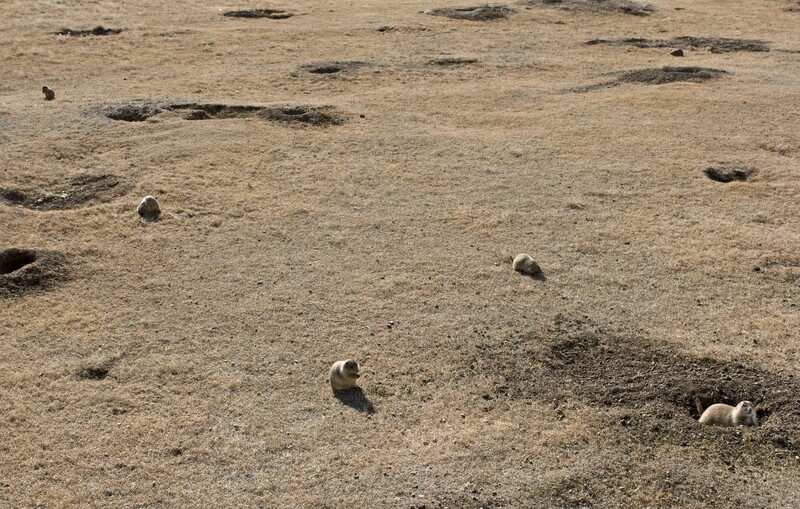 Prairie dogs prefer open land with low vegetation. This allows them to survive predatory feeding. They will avoid tall grass and woodlands preferring low grasslands with little water. Prairie dogs will eat a lot during any one day. Most will consume their body weight in grass. They will also eat seeds, many species of grass, flowers, roots and insects. Prairie dogs will eventually increase their number to create towns which are then broken down into coteries. A coterie usually has a male, several females and their offspring. Their towns will have 30-50 borrow entrances which usually have mounds that are on average 2 feet tall by 10 feet wide. These mounds serve as a lookout station and help to keep water out of their burrows during floods. Prairie dogs are most active during the day. During summer they will feed in the morning and afternoon, leaving the surface during the hottest time to seek the cool of their dens. Though some hibernate during the winter, most are active year round and will surface even when snow has accumulated. Most prairie dogs will live 5-8 years on average. Females can reproduce by their second year. Most litters will arrive as early as January but generally in February and March. Litters will have 4-8 pups which will emerge from their dens in late spring and early summer 3-4 months after they are born. Prairie dogs, like gophers, attract predatory animals. This list includes badgers, weasels, ferrets, coyotes, bobcats, hawks and fox. Snakes like young dogs as well. Vacant burrows will attract a host of animals all looking for a good place to live. Rabbits, rodents, reptiles, insects and several species of birds all like to be around prairie dog towns. Prairie dogs become a problem when their populations and towns get established around urban property. Innocent at first, letting them live close to your land means they’ll eventually want to move onto your land. Prairie dogs eat everything and this constant demand for food will deplete local vegetation much needed by livestock and other plains feeding animals. As prairie dogs clear local food they will spread to new areas settling where food is readily available. This has long been one of the main problems associated with prairie dog activity; ranchers and farmers have a long history of combating the prairie dog over land use. Prairie dog burrows lend to rapid soil erosion as well. When coupled with big reductions in vegetation the landscape can rapidly change once they start living in any one area. Furthermore, burrows present a danger to livestock. Their holes can readily trip and injure unsuspecting animals or damage farm equipment. Prairie dogs carry many types of bacteria including plague. This alone is reason to keep their numbers minimized around people. Furthermore, abandoned burrows become homes to rattlesnakes and a range of poisonous insects – including black widow spiders – will readily take advantage of the spaces inside their dens. For this reason its advised that any activity around your home be addressed as soon as possible. Don’t let them multiply or get established close to where you intend on farming or using any land for recreation. Don’t let their looks deceive you; two or three prairie dogs will quickly become 10 and 20. Soon your turf will be destroyed and erosion will begin to take its toll. 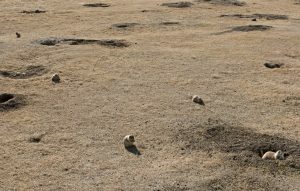 In the end you will have to remove the prairie dogs in order to stop the destruction and since it is so much easier to deal with the first few before they begin to reproduce, there is no good reason to wait. If there are prairie dogs in the region where you live and you’d like to ensure they don’t move onto your land, use repellents along property borders. In general, foraging dogs looking for a new place to live will ignore areas where they sense danger or where they’re not comfortable. 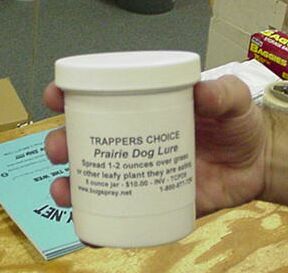 We offer a few repellents prairie dogs don’t like. The first is to set out a predator scent like COYOTE URINE. Dogs know this odor and will avoid where coyotes are marking territory so if applied before they’re on your land, it should keep them out. Plan on using 2 oz per 10 feet for 30 days of protection. Pints will treat 80 linear feet, 1/2 gallon will protect 320 feet and a gallon up to 640 feet. The best way to apply it is to use 1-2 oz spread our along property borders. Use it on a tree, fence or right on the turf. Prairie dogs are constantly looking for food and know the risks associated with foraging. If they smell fresh coyote urine they will try to move in an opposite direction attempting to minimize the risk of having to come face to face with a coyote. The use of coyote urine is particularly helpful if you have fields or lots of land adjacent to yours which are not being treated. By placing urine along the property line you can create a “fence” which will keep the dogs out and away. In general, applications will last 30+ days during normal weather patterns. But if you want the urine to last longer, protect them with LIQUID GUARDS. These plastic stations are staked in the ground and shelter the urine from rain and sun. This will allow the scent to last 2-3 times longer so they will effectively pay for themselves in very little time. Space the large guards 8-12 feet apart along property lines. Each station has two sides which can hold 1.5 oz. Please .5-1 oz per side. CAPSULE GUARDS are much smaller and can only hold about 1/2 oz. Use the included eye dropper to fill the capsule then cap it and “push” it into the ground making placements every 5 feet along property borders. Another effective way to keep them out of the yard is to install some of our sound repelling devices. We feature two types; one for above ground, long distance coverage and the other is a “ground stake” low profile design. For protection over large areas where prairie dogs can come from different angles, our ABOVE GROUND SOUND REPELLERS are the way to go. These units are very effective on prairie dogs to the extent that they can actually chase away animals already living in the yard. By default, each machine emits an ultra sound people cannot hear. But prairie dogs are very sensitive to this sound. These can also be set to include an audible sound and you can run them only during the day or night or all the time. Our units come with a wireless “on/off” control so you can turn them off as needed. They also include a small power supply so you can power them with electricity. So if you want to chase off current populations, you’ll need to use the unit with the included power supply brick. Power it to “always on” and turn the audible sound dial to “zero” as the ultra sound alone will be strong enough as long as the machine is on all the time. The sound will have an effective range up to 75 feet and can cover 4,000 sq/ft when used for prairie dogs. They are directional so make sure you have them pointed at their nest dens. Plan on running the machine continuously for at least 2 weeks if you need to chase off prairie dogs already living on your land. Once they’re gone, you can power them with batteries and use the motion detector setting. Just remember the unit will need to be close to the ports of entry since it will only detect motion up to 25 feet away. When you power them on all the time, animals will stay away for 75 feet or more. Mounting Blocks allow you to place units anywhere and they will save time too. For a more “discreet” installment, our line of sonic sound ground stake repellers is probably your best bet for long term control. Once installed, you’ll be able to keep away prairie dogs for good. We feature two units; one is strong enough to use as a barrier along property lines to keep foraging prairie dogs looking for homes away from your yard. The second unit is much stronger incorporating ultra sound along with the standard vibration and sound our basic unit provides. But the deluxe unit is strong enough to be used directly in active prairie dog dens so you can actually chase them off your property. There are lots of these units on the market these days but most are under powered and won’t be strong enough to handle the job when it comes to prairie dogs. But the science is proven. 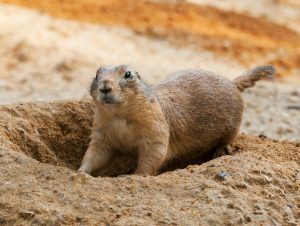 Basically ground burrowing animals like prairie dogs will avoid dirt under construction or where they hear ongoing “noise”. For this reason, devices which intentionally send out sound waves can be used to both chase away prairie dogs and keep them from entering your property in the first place. So are they strong enough to get rid of the prairie dogs already in your yard? Absolutely. But only our deluxe model (the second one below) should be used when you have an existing population. So if you’ve had prairie dogs in the yard and you want to make sure they don’t come back this year, install our basic SOLAR POWERED PRAIRIE DOG CHASERS along property borders. 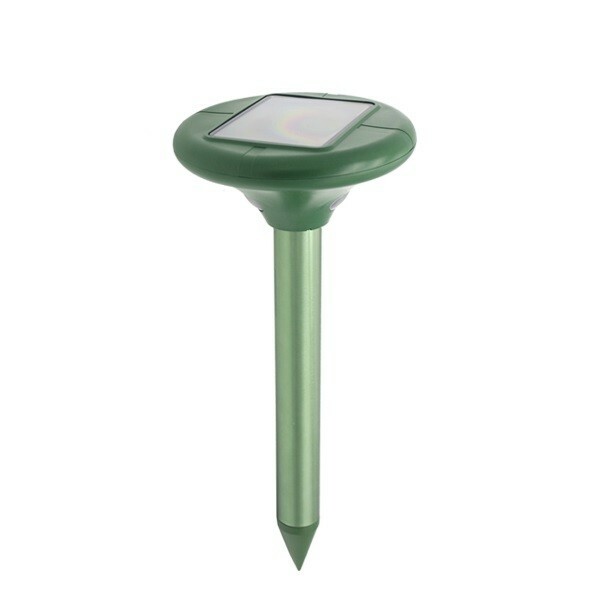 This device uses sunlight to charge a small battery which in turn will keep the unit running all day and all night. In fact it can run several days without sun so once installed, you’ll have 24 hours a day protection. This basic unit can cover up to 6,500 sq/ft and if placed along property lines where prairie dogs might enter, these units will effectively reroute any nuisance animal elsewhere. Coverage is about 4,000-6,500 sq/ft depending on soil type. Soft, loamy soil like that typically found along water ways will tend to absorb the sound and effectively deaden it. This means coverage will be thwarted and reduced to the lower range of 4,000-5,000 sq/ft. But for hard pan, clay type soil, coverage can be 5,000-6,500 sq/ft. When placed along property lines, install units every 60-75 feet. When the units arrive, they will have a slight charge but its not enough to use afield. So before installing them, we recommend letting them sit out in sunlight (turned off) for at least one day to get a good charge on their battery. This way when you deploy them in the yard, they’ll be ready to work at full strength. Now if you have active prairie dogs, you’ll need the next unit down the page as its much stronger and the only one that can chase away even nesting animals. So if you have active prairie dogs centered on your property say in a garden or flower bed, our DELUXE PRAIRIE DOG REPELLER will be needed. This model is one of kind and not available elsewhere. True, there are models which looks like it. But they don’t have all the features our units have which are needed for certain animals like prairie dogs, ground squirrels, chipmunks and voles. Our deluxe model works essentially the same as the basic unit above. It too uses the sun to charge an on board replaceable battery so it runs on its own, around the clock. And it releases a vibration that will both move the ground and create a sound wave that will “rattle” prairie dogs so they want to leave. But our deluxe model incorporates other sounds making them well suited for control of existing problems. This means they’re not just good for prevention; they can be strong enough to displace animals for good. The rule here is if you can go 2 or more weeks with no new activity after they’re installed, then you’re good. But if they come back within 2 weeks, gassing of the tunnels will be required (see below). As stated, this unit will vibrate several times a minute constantly rotating the sound cycle. But it also sends out “ultra sound”. In general, ultra sound won’t help fight true under the ground dwellers like moles since they’re down in the ground and well protected. This is why all the other units like this on the market don’t include ultra sound. But for animals that like to forage up out of the ground (like prairie dogs), ultra sound is helpful and for the most part, a necessity if you’re trying to treat an active problem. In addition to the ultra sound being sent out, it also uses LED bulbs located just underneath the controller head. These light up when its dark which effectively give the units an “evil” look at night. Small animals that like to forage on the ground will look up and see these discreet lights and perceive it to be a predator. This in turn will make them uncomfortable and nervous. Combined with the ultra sound, the vibration and the audible sound, the deluxe repeller is powerful enough to be used in the middle of a an active prairie dogs colony and within two weeks, can be enough to force them to leave. So if you have active prairie dogs and want to use this unit as a way to get them to leave, only deploy units directly to active tunnels and nests. Do not install units along property borders for the first two weeks. This will give the nesting prairie dogs a way to escape. After two weeks of no activity, you should be able to move units out of the tunnels and further out into the yard but if animals are attempting to come back, use the gassers below to ensure they don’t. Using this process you can effectively take back your yard bit by bit as you push nesting animals back and away from your home and ultimately out of the yard. Coverage for these units is a bit more compared to the basic unit. So for loamy soft soil, plan on getting 4,000-5,000 sq/ft of coverage. But for hard pan, 6,500 to 7,500 sq/ft per unit is to be expected. Along property borders, place units every 45-50 feet. Setup for these is like the other unit in that you’ll want to let the head unit charge for 1-2 days prior to setting them out in the yard. This way they go afield under full power making them best suited to get the job done. For more detailed directions on how to set them up, download our SETUP DIRECTIONS. Regardless of which unit you get, you need to properly prepare the ground by drilling a smooth hole for them to fill. The hole must be the proper depth and width. Our SOIL AUGER is perfectly designed for the task. Simply attach it to your favorite hand drill and take it out to the yard for the task at hand. Holes can be drilled in 10-20 seconds and will be just right. Plan on making them about 9 inches deep as units need to be installed so 1-2″ stick out to keep the head unit off the ground. If you have several burrows throughout your yard but are not quite sure which ones are active or need repellers, the use of GAS STICKS can help. These are sulfur gas smokers that have fuses. To use, light the fuse and then place the smoker down the burrow. The intention of this product is to make the tunnel and den uninhabital by prairie dogs by overloading it with sulfur. It usually takes 1 gasser to treat the average burrow but for large tunnels, two might be needed. Once you’ve gassed any tunnel you see, fill them with dirt and in most cases, this will be enough to keep them away. But if they are stubborn and return within two weeks, you’ll need to gas them again and then install one of our repellers directly into the burrow as well. 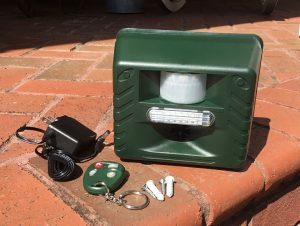 This can be needed when burrows are important such as breeding dens or feeder stations. Now if you’ve already installed any of our ground stake repellers listed above and have animals returning, then you’ll definitely need to use one of these to make the tunnel unuseable for even the most stubborn animals. The 4 pack is usually enough to treat up to 2-3 dens; expect to use two sticks per den for every den that has 2-3 entry/exit holes. Also, using these in conjunction with our DELUXE SOUND REPELLERS listed above is surefire way to ensure they don’t come back. If you prefer a more “permanent” solution, removing prairie dogs can be done with live traps or kill traps. Live traps might sound tedious but for small populations, its highly effective. 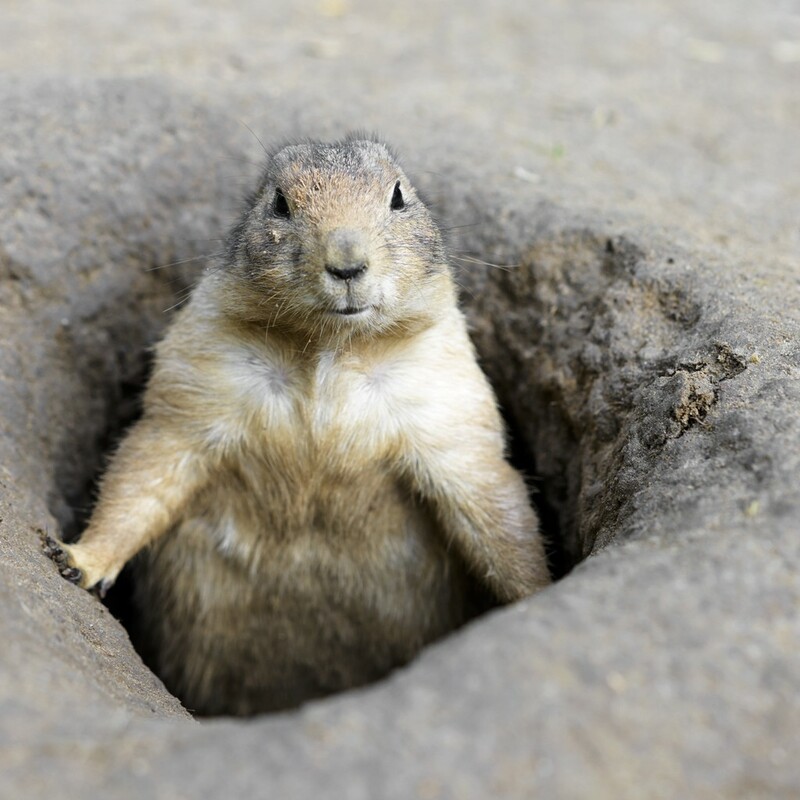 With the right trap and bait, prairie dogs are easy to catch. From there you can either destroy or relocate the animal desired. Live trapping prairie dogs can be accomplished by placing traps alongside their dens. The two best traps are either the LT5518RD or the LT7824. These are commercial grade and will last for many years. 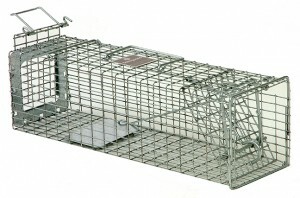 The LT5518 measures 5″ x 5″ x 18″ and features a sliding rear door making baiting the trap and releasing the animal easy. The LT7824 measures 7″ x 8″ x 24″ and is large enough to bait and release animals using just the front door. To get the dogs to enter, place a bit of their favorite local food at the trap entrance and then more in behind the trip pan. Add PRAIRIE DOG LURE on the trip pan too along with 1 tablespoon on the grass behind it. This lure is a mix of grasses which has a strong smell sure to get their attention. You still need to add grass behind the trip pan since this is what they “naturally” eat and expect to see. Remember, the more traps you use the faster you’ll clear out the population. And if you have a lot of dogs to catch, with the “over the den” trap. This model is our LT111236BD and it features a unique design that does not need bait. Just place it directly over the prairie dog entrance/exit holes on their mounds. 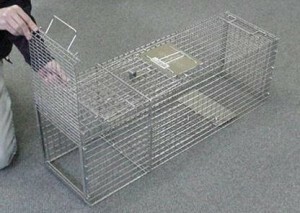 This trap has a sealed front with a cage all the way around (except for the bottom which you place over their hole). Dogs exiting their den will effectively be “inside” the trap with only one direction to go. Since they have no choice but to head toward the back of the trap and once they hit the trip pan, they’ll be caught. When using this trap, be ready to remove the trapped dogs throughout the day. It’s not unusual to catch several a day and they generally don’t grow afraid since it is not killing them. Kill traps are probably the most effective trap that can be used when relocation is out of the question. Known as Bodygrip traps, this design is both easy to use and very effective. For prairie dogs, the most common sizes used are the BG 120, BG 160 and in some cases, the larger BG 220. Simply place the trap directly over their den. As the local resident attempts to exit, they’ll stick their head into the trigger of the trap causing it to close and deliver a lethal grip to the target animal. You do need to anchor the trap so you won’t loose it to predators in case you can’t remove the trapped animal quickly. This will also ensure they don’t drag it down their den if the trap is being deployed over a large hole. Be sure to check trap sets daily and even after you catch one for the day. Like the live trap, residents will keep exiting and getting caught so expect fast results. For den holes 5″ or less, go with the double spring BG 120 traps. For dens 6″ or smaller, the BG 160 will be better suited. For any den with 7″ or larger holes, go with BG 220 traps. For holes larger than 7″, you should try to “shrink” the hole by placing plywood or paneling over 1-2 edges. 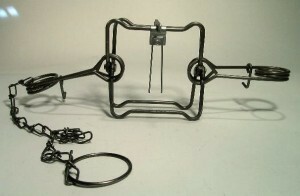 The goal is to effectively limit the size down to the trap width so the exiting animal cannot squeeze through any gap left by a trap which is not large enough to cover the entire hole. Any of these traps can be set by hand but in general, using TRAP SETTERS will make the sets much easier to handle and manage.